EAT SHOP Take a walk along the beautiful tree-lined streets while visiting the community and you will see a diversified selection of businesses offering all services – shopping, dining and accommodations for both residents and visitors alike. Head downtown for a bite at CJ's Deli & Restaurant – a popular local eatery. Across the street, Coutts Home Hardware is the place to pick up your outdoor and camping supplies. Plan to attend the Christmas Market in November with over 40 vendors. Did you know? 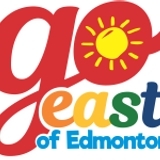 You can create your own NorthSouth Tour of the Go East Region by driving Highway 36. From Alliance in Flagstaff County you can travel North all the way to the Lac La Biche Region on Highway 36. In 2005, Highway 36 was also named Veterans Memorial Highway in honour of the contributions of Alberta’s veterans. 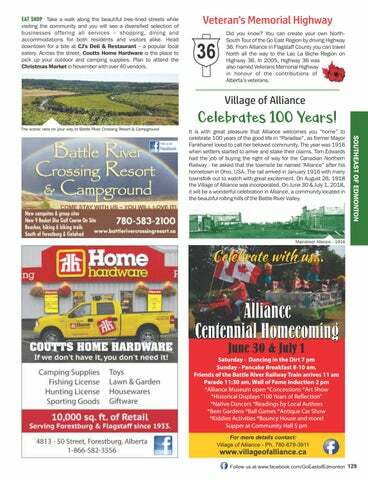 It is with great pleasure that Alliance welcomes you “home” to celebrate 100 years of the good life in “Paradise”, as former Mayor Fankhanel loved to call her beloved community. The year was 1916 when settlers started to arrive and stake their claims. Tom Edwards had the job of buying the right of way for the Canadian Northern Railway - he asked that the townsite be named “Alliance” after his hometown in Ohio, USA. The rail arrived in January 1916 with many townsfolk out to watch with great excitement. On August 26, 1918 the Village of Alliance was incorporated. On June 30 & July 1, 2018, it will be a wonderful celebration in Alliance, a community located in the beautiful rolling hills of the Battle River Valley.